Because text messages are nearly always read, they are an ideal way to communicate alerts or reminders for employees, suppliers or end customers. Add strong authentication to your app with second factor passwords sent to a user’s phone via SMS or Voice for an extra layer of security. Coordinations with the field can be a headache. Use automated SMS and Voice Dispatch Notifications from your existing service management system and increase precision. To learn more about this product please download the brochure. Receive customer feedback easily with Automated Voice or SMS Surveys directly integrated with your existing CRM and customer databases. Instantly provision and assign local phone numbers to ad campaigns for metrics, real-time call and message routing, and live lead distribution. The business applications of using SMS with inTouch in AX are endless. With this solution, you can contact your customers, vendors, employees directly from Dynamics 365/AX. 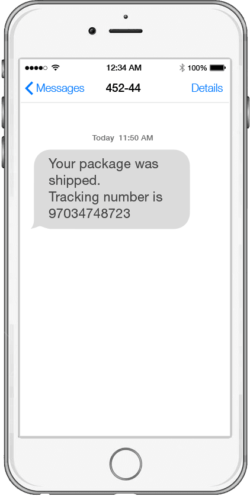 You can create an SMS alert on each step (confirmation, picking, packing, invoice) of sales order process. You can send ETA alerts with arrival estimates and arrival confirmations, directly integrated with an existing GPS, field service, and order tracking systems. You can use automated SMS to coordinate with the field from your existing service management system and increase precision. Let technicians and customers use their own phone numbers masked for secure and logged calling and texting. No more mobile app download requirements. Customers can send MMS messages to technicians and customer service teams with images of what needs to be resolved, embedded into work order details. Use text messages and voice to alert sales reps of new leads from existing web-lead, order management, and CRM systems.